Home Andalucia Please don’t rain on our parade! Please don’t rain on our parade! JESUS will certainly have to come up with a miracle, with weather forecasters predicting heavy rain across the region from Thursday onwards. 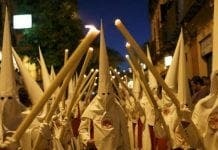 Millions of people who have travelled the length and breadth of the country to enjoy the Semana Santa celebrations are likely to have their spirits dampened.